The fall migration of smoker king mackerel gets kicked off, awarding anglers with some of the best kingfishing in the world. Thirty to forty pounders are common during these fall months, with the action endless. Grouper migrate closer to shore, allowing clients to experience the best of both worlds: the 30mph run of a smoker king, combined with a back breaking tug from a tasty grouper! Along with the temperature, the action is hot! Offshore wrecks will provide clients with all the barracuda they can handle on light tackle. Big cobia can also be had. Monster goliath grouper cruise the wrecks, just daring the bravest anglers to go to battle. If you think you can handle one of these bruisers, we’ll be glad to strap you in! The goliath’s average weight is about three hundred pounds. We did somehow manage to drag a whopping 600-pounder to the surface recently. Grouper and snapper fishing can also be outstanding in depths of 100 feet of water. We can’t forget about the sharks. They are everywhere and ready to attack. It’s truly a great time to fish. Offshore action is not the only game in town. Some of the best Tarpon fishing in the world can be experienced during these summer months. Imagine, a massive school of a 100 plus silver kings easing your way only a few hundred yards from the beach. Knowing that within seconds you’re about to hook into the best fighting game fish in the world. That’s enough to make your heart come clear out your chest! We average three to five tarpon a day, ranging from 80 to 200 pounds! Be sure to book a trip in advance since open dates are limited. These magical months are when it all busts loose. Numerous game fish migrate our way, ready to attack a baited hook. 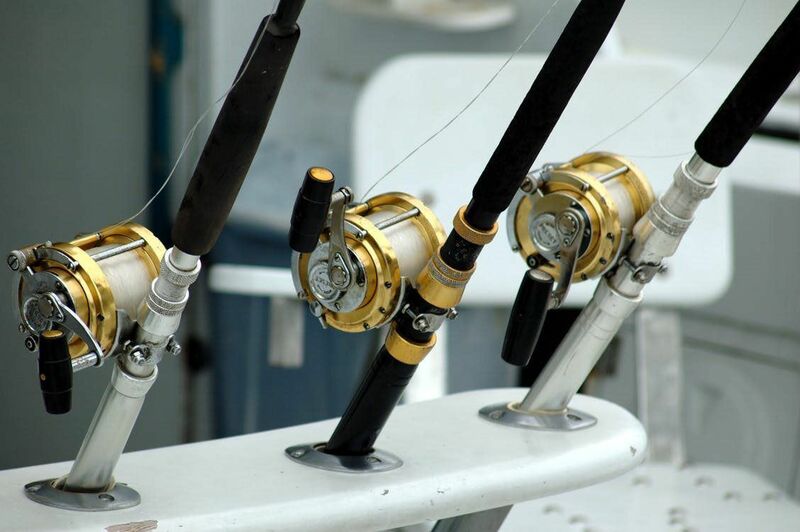 Amberjacks and grouper are plentiful on the wrecks… thousands of kingfish invade eating everything in sight… 30lb. black fin tunas are mixed in with 100 lb. spinner sharks devouring every bait presented behind commercial shrimp boats… monster barracuda blanket the offshore wrecks eager to attack a slow trolled 5 lb. mackerel… three hundred plus pound goliath groupers are quite willing to jerk you over the gunnels… and even sailfish make surprising appearances behind our spread… the list is endless! Grouper, amberjacks and snapper are plentiful during these winter months, providing clients with some great tug-of-war action. Not only is their table fare some of the best, but truly a backbreaking experience when trying to pry one of these beastly fish away from the wrecks. Good eatin’ and great catchin’… it doesn’t get any better!